Advent as a time of waiting can be hard for kids to understand. They are surrounded by Christmas everywhere they look during December. At the Catholic school where I work, we try to keep Advent as its own season, but I have to admit that can also be a little hard, especially because we don't have school during the end of Advent and most of the actual Christmas season. As a result, things like our Christmas music program, Christmas parties, Christmas decorations, etc. are all a part of the first three weeks of December, and are over when we come back to school in the first week of January. One tradition I have missed experiencing with the kids is moving the figures of our Nativity around during the Christmas season. In our classroom, Baby Jesus is not with the Nativity- he sits in the center of the Advent wreath as a reminder of what we are waiting for. This year I decided to be adventurous and moved our Wise Men around the room every day. A bit inspired by the Elf-on-the-Shelf-craze, but with a very different motive, I wanted to add some fun and whimsy to the season and also some real feeling of anticipation. We were also able to incorporate a deeper meaning to an all school tradition as well. During our morning prayer, the school teaches about the Jesse Tree throughout each day in December. The symbols on the Jesse Tree remind us of the people in Christ's bloodline and the prophecies of the coming Messiah. The real Wise Men came to see that very Messiah, and knew of what the prophets had said of Him. Each morning when my students came in to the classroom, they found our Wise Men somewhere doing something new, sometimes just for fun, and sometimes with a deeper message. They also brought our piece for the classroom Jesse Tree each day, and we discussed the addition of that piece and how it pointed to Christ. When we go back to school on the day after Epiphany, the kids will find the Wise Men gathered with Mary and Joseph where we left them, adoring the Baby Jesus. The Wise Men were found googling directions to Bethlehem, zeroing in on the Church of the Nativity. They left the map up on the Smart Board, and we explored pictures of the area where Christ was born. Tucked under the Wise Men was a piece for our Jesse Tree for Adam and Eve. The Wise Men were caught playing one of our Beatitudes Card Games with Fr. Juan Pablo and Sr. Mary Clara. This game was a great way to remind us of the virtues Christ calls us to emulate, which are great to practice during Advent. The winner of the game brought us our Jesse Tree Card. The Wise Men were "caught" up trying to make their own KidKnits hat, maybe to use as a gift for the new baby Jesus. They were having a little trouble though, because the yarn wound all the way around our classroom, leading us to the Jesse Tree Card. ...and then hid in among Miss Bogner's owl collection shelf! This was one of the hardest spots for the kids to find, but they were still pretty quick! The Wise Men parachuted in on our classroom clothesline with a reminder of who we are really waiting for! 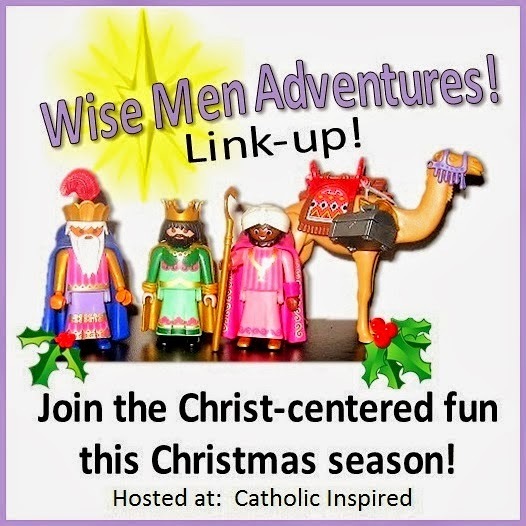 I didn't know about it beforehand, but now that I have this post finished, Catholic Inspired is hosting a Wise Men Adventures Link Up! Head on over there for more ideas, and I'll be back with the rest of our classroom Wise Men hijinks! Thank you, Katie Anne for this great post and ideas. I will share it with some of our school's religion teachers. God bless you and your work.